News stories involving religion in one way or another — whether in legal, cultural, or political affairs — seem to be increasing. Each day, one notices more and more news items that deal with religion. That is one reason why The Oxford Handbook of Religion and the American News Media (OUP 2012), edited by Diane Winston (USC) is a welcome and very useful contribution to the sociology of religion literature. The publisher’s description of this massive work follows. Once relegated to the private sphere, or confined to its own section of the newspaper, religion is now a major part of daily news coverage. Every journalist needs a basic knowledge of religion to cover everything from presidential elections to the war in Iraq to the ethical issues raised by latest developments in medical research. 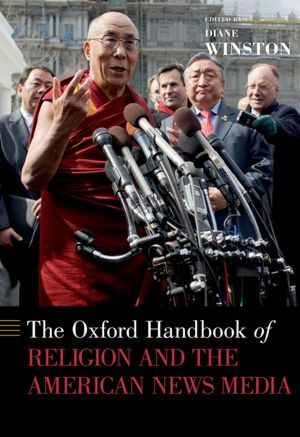 The Oxford Handbook of Religion and the American News Media will be the go-to volume for both secular and religious journalists and journalism educators, scholars in media studies, journalism studies, religious studies, and American studies. Comprised of six sections, the first examines the history of the mass media and the role religion played in its growth. The second looks at how the major media formats–print, broadcast, and online–deal with religion. The next two examines how journalists cover major religious traditions and particular issues that have religion angles. The fifth examines the religious press, from the Christian Broadcasting Network to The Forward. The final section looks at how the American press covers the rest of the world.